One of the holy grails as a modern executive is the concept of earning more … while working less. It seems almost unattainable, especially if you’re in growth mode. So, how do you find ways to not only enjoy your work and find the seemingly mythical ‘work-life balance’ all while working less and making more? We know from decades of research that constantly working and always being considered ‘on the clock’ is bad for your health, your relationships and your pursuit of other activities — such as hobbies or traveling. You are more than your work, even if your work is your passion or your cause in life. 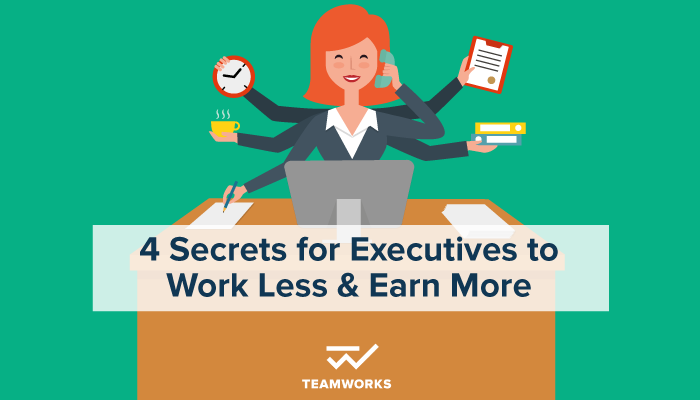 Here are four secrets to working less and earning more as an executive. The bonus, they will also help your organization earn more and help the people who work with you feel empowered. It’s a win/win/win! Here’s something that many executives don’t always understand at first: salary is very important to many people, it’s often one of the main aspects someone considers when taking a new job. But … it’s not always the most important piece of the employment puzzle. Salary alone only creates a transactional tie back to the organization. If the organization begins to flail or flounder, an employee who is only there for the salary will be among the first to leave. But if that same employee is connected to the purpose, vision, or mission — whatever word you choose to use is OK — that’s a transformative tie. Those people weather the storms with you because they believe in the work. Think of it in the context of a marriage. If you only marry someone because they’re attractive or have a lot of money, what happens when they are less attractive or lose that money? But if you marry them because you believe in something about them and how you are together, you make an effort to stick through the tough times. As a leader, when you effectively set the vision and share the purpose with your employees, it benefits you in the intermediate to long-run too. When employees are engaged with the purpose, they are subsequently engaged to do more of the work. This means you can do less of the work, or rather — you can focus in core strategic areas that not only are a better use of your time, they also feed your passion and purpose for the work as well. Setting and sharing the vision and purpose for the organization gets your team excited and empowered to take more action and more responsibility, allowing you to allocate your time to activities that better serve the bottom line, and your personal sanity. The hiring practices of many companies can seem confusing on the surface. During an interview they attempt to learn about the achievements, background and values of a potential hire. Once that person has been vetted and they believe the candidate can do the job – they hire them and agree to pay the candidate a certain amount of money in return for doing their new job. But then an interesting thing happens. Despite approving this person and believing in their skills managers instantly micromanage the work of a new hire. This is logical in one respect, as you want to make sure they understand your core business processes. But it can begin to erode trust quickly and add more work to your already overflowing plate. If you want to work less but earn more, the simplest path to doing so is trusting people to do what they’re good at. If you’re a leader in an organization, there are certain initiatives or projects that you must be involved in, of course. But those are few and far between and tend to impact long-term strategy, branding, or market position. Believing that you must be involved in every single project will only having you working more – not less. Instead, step back and empower the people you’ve hired to do the jobs you’ve hired them to do. There has been much research attempting to quantify the relationship between hours worked and productivity. A study published by John Pencavel of Stanford University found that employee output falls sharply after a 50-hour work-week, and falls off a cliff after 55 hours—so much so that someone who puts in 70 hours produces nothing more with those extra 15 hours. Working 55 hours/week is still a lot — 11 hours/day on a five-day work week — but it’s better than 70-80, which some executives pull regularly. The important thing to remember is that productivity wanes and drains if you’re on the clock too much. The easiest parallel here is what happens when you call IT or customer service for most tech products. What do they tell you to do, usually? “Restart” or “power off.” It’s kind of a joke to some by now, but it works with humans too: we need to restart or power off, or else we’re not actually achieving goals anymore. Big surprise here, one of the keys to working less….is actually choosing to work less! Stop convincing yourself that an 80 work week is the only way to success. Take control of your time. 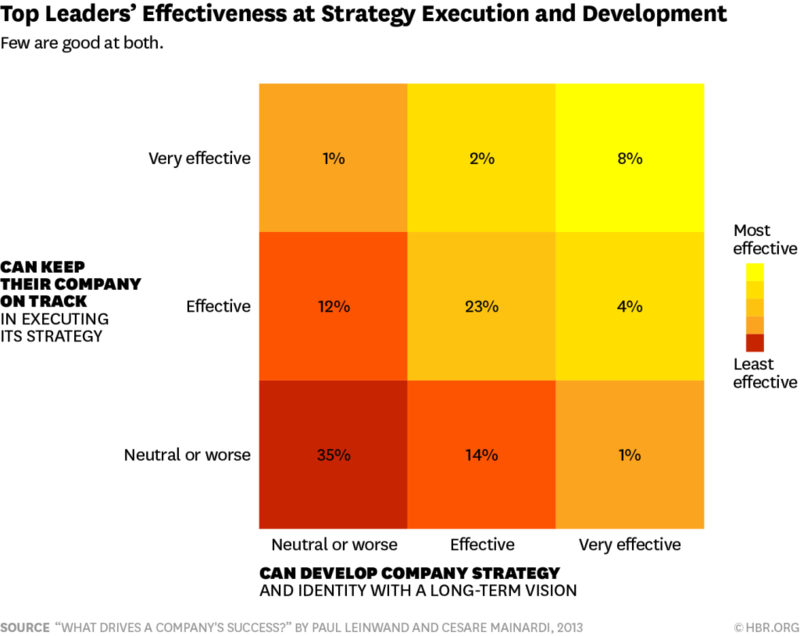 In any organization, there is the “strategy” — which is the long-term vision for where the company is going, driven by market position and your organizational capabilities. There’s also the “execution,” which is the day-to-day work of driving that strategy forward. This is the single greatest reason that you – and the other senior leaders in your organization – end up working too much. When execution (day-to-day) isn’t reflecting strategy (long-term vision), senior leaders feel the need to jump in on every project and course-correct. Spend more time ensuring that the daily actions and activities of everyone in the organization are aligned with the long-term strategic vision. When the day-to-day work is reflecting long-term goals, your company will be humming along with less fires to put out. Again, giving you back more time and energy allowing you to work less! Work-life balance can often seem like a massive buzzword, especially to those of us passionate about growing our companies and achieving huge results. But it can be done with a few shifts in how we think and align our work. Implement these four strategies and before you know it, you will be working less and earning more. What other tactics have you tried for earning a bit more while working a bit less?